Capt. Richard G. Cliff, Jr., 29, was killed Sept. 29 while conducting a combat reconnaissance patrol in the vicinity of Yakhchal, Helmand Province, Afghanistan, in support of combat operations while serving with Company B, 1st Battalion, 7th Special Forces Group (Airborne). He deployed in support of Operation Enduring Freedom in Sept. 2008 as a member of the Combined Joint Special Operations Task Force – Afghanistan. This was his third deployment in support of the Global War on Terror and first deployment to Afghanistan. He was a Special Forces Operational Detachment-Alpha team commander. 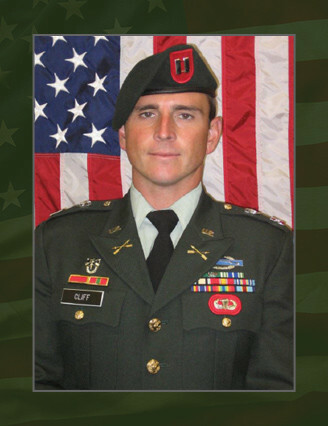 Cliff was a native of Mount Pleasant, S.C., and was commissioned in June 2002 after graduation from Appalachian State University, Boone N.C. After a variety of infantry positions in the Army he began the Special Forces Qualification Course June 2007 and he earned the coveted “Green Beret” in July 2008. Cliff’s military education includes the Maneuver Captains Career Course, Infantry Officer Basic Course, Survival, Evasion, Resistance and Escape Course, Basic Airborne Course, Ranger Course, and Special Forces Qualification Course. His awards and decorations include the Bronze Star Medal, Purple Heart Medal, five Army Commendation Medals (one for valor), Army Achievement Medal, National Defense Service Medal, Afghanistan Campaign Medal, Iraq Campaign Medal, Global War on Terrorism Expeditionary Medal, Global War on Terrorism Service Medal, Army Service Ribbon, Overseas Service Medal, Combat Infantryman Badge, Expert Infantryman Badge, Parachutist Badge, Ranger Tab and the Special Forces Tab. Cliff is survived by his wife, Stacy, and son, Richard, of Sanford, N.C.; mother Julie Cliff, and father Richard Cliff, Sr., and brother Eddie Cliff, all of Mount Pleasant, S.C.